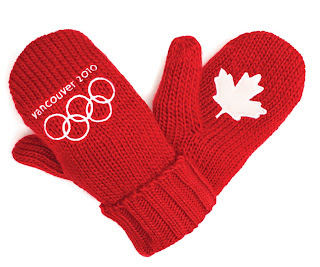 The Vancouver 2010 Olympic Games are less than two months away. The excitement across Canada continues to burn as the Olympic flame makes it's journey of over 40 000 miles. Most recently the torch made it's way through Southern Ontario. While making a stop in the Niagara Region, a sea of red mittens through each crowd was proof of Canadian pride. In St. Catharines, former Lacrosse player, Mike Accursi was the official torch bearer. He spoke of the immense pride in being chosen to represent his community. Currently a high school teacher at Holy Cross Secondary School in St.Catharines, he said this was an honour and the result of his family teaching him about the value and results of hard work. Other members of the team were seen wearing the white, teal and grey suits keeping them warm from the cold winter elements. This year the Hudson Bay Company is the official clothier of the Olympic Games. You can join in the the support of the games by purchasing your own Olympic gear by visiting the HBC website for more information.